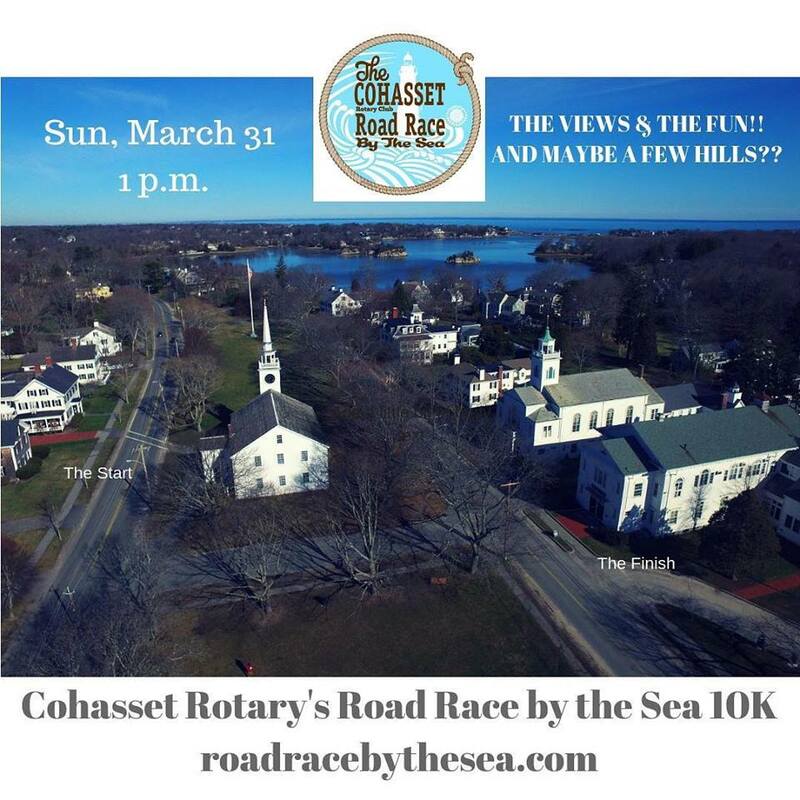 The Cohasset Rotary Road Race by the Sea 10K is the best way to start the running season. 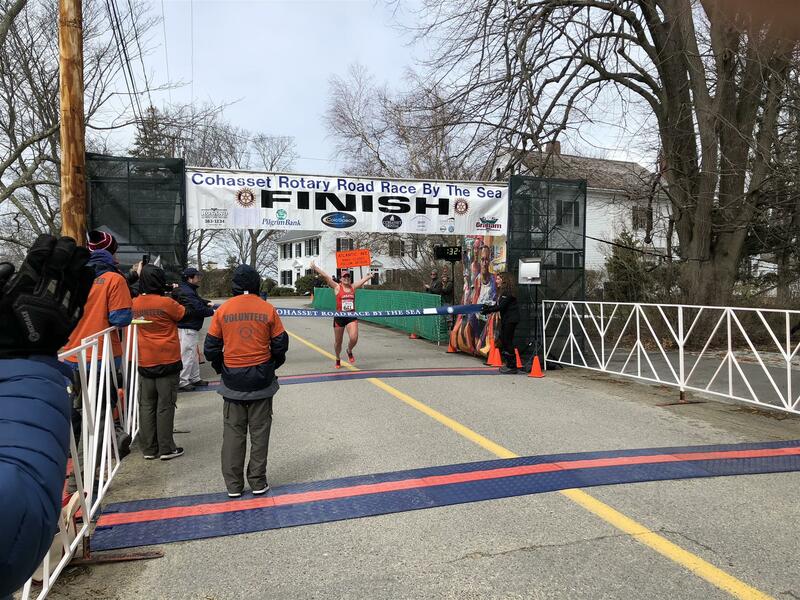 For 42 years Cohasset Road Race by the Sea has been a spring tradition and training run for the Boston Marathon, and remains one of Cohasset Rotary Club’s most important fundraisers. 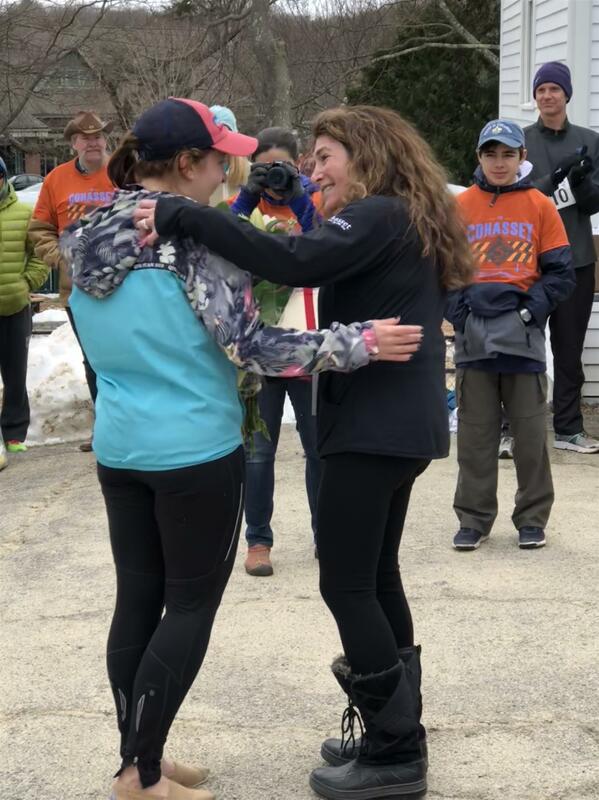 We have the happiest runners and it shows! Great views and lots of fun! All runners receive our collected long sleeve tee shirt. Runners register here www.roadracebythesea.com. Our 175 volunteers (almost half are high school students!) are instrumental in making this a fun and successful day. We need people at registration passing out bibs and tee shirts, people guarding intersections, in the kitchen cooking hot dogs, cutting bagels and fruit. All volunteers receive a tee shirt. If you would like to volunteer register here! 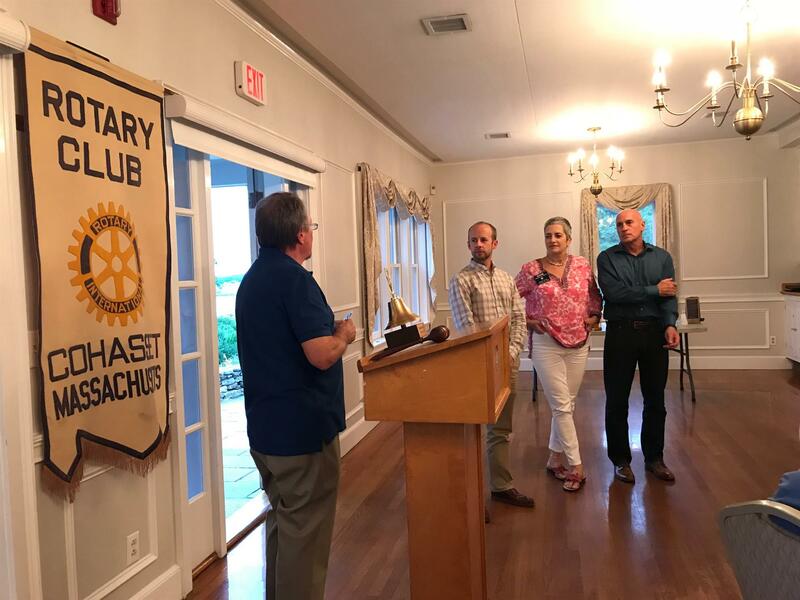 Cohasset Rotary Club held their elections for the 2019-20 year. 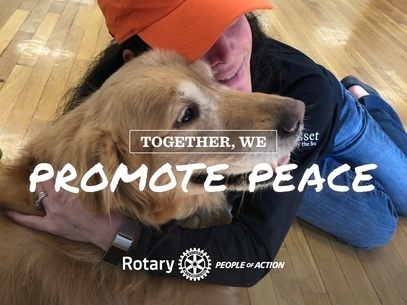 Rotary years run July 1 - June 30 of the next year. 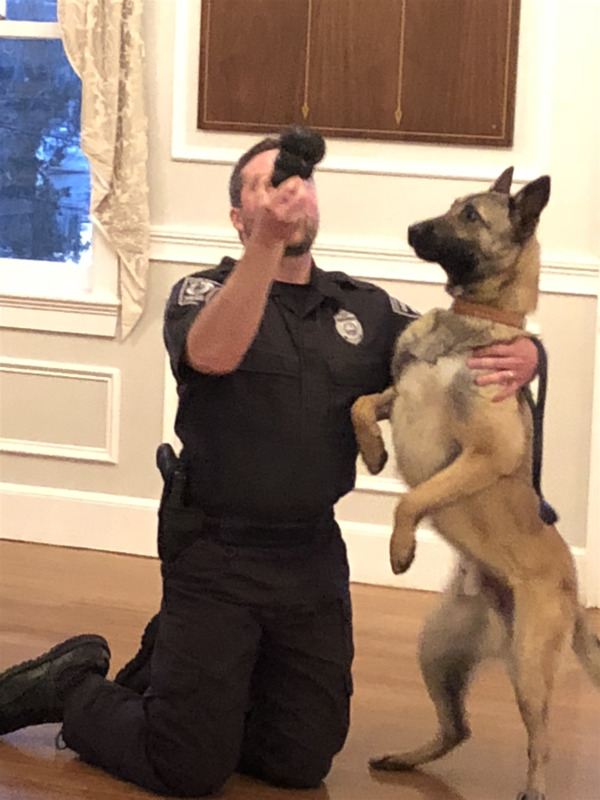 Officers were voted in unanimously. 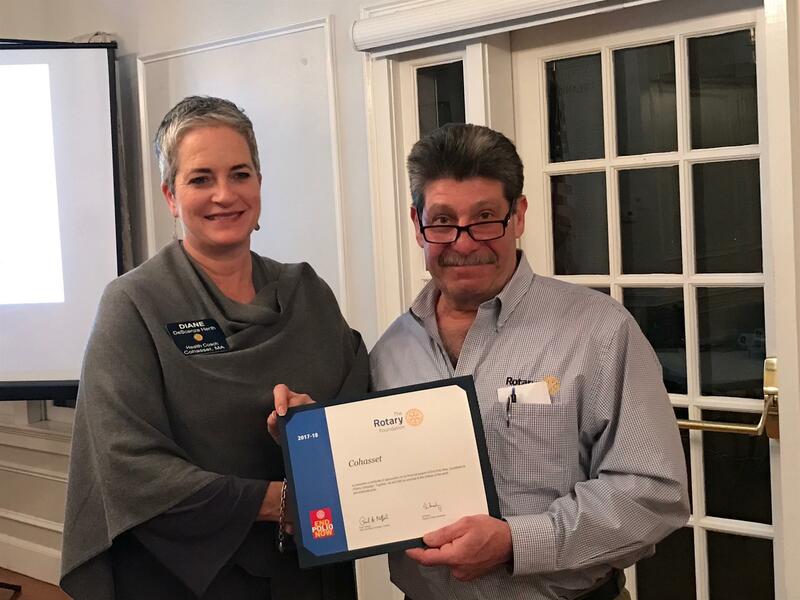 District Governor (2017-18) Steve Certa presented an award to Cohasset Rotary Club for exemplary donations to fund Polio Plus and End Polio Now. 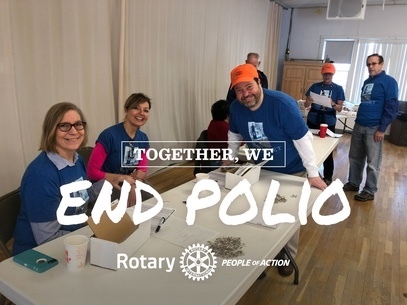 Cohasset Rotary Club annually supports Polio Plus with a donation of $100/member in the club. 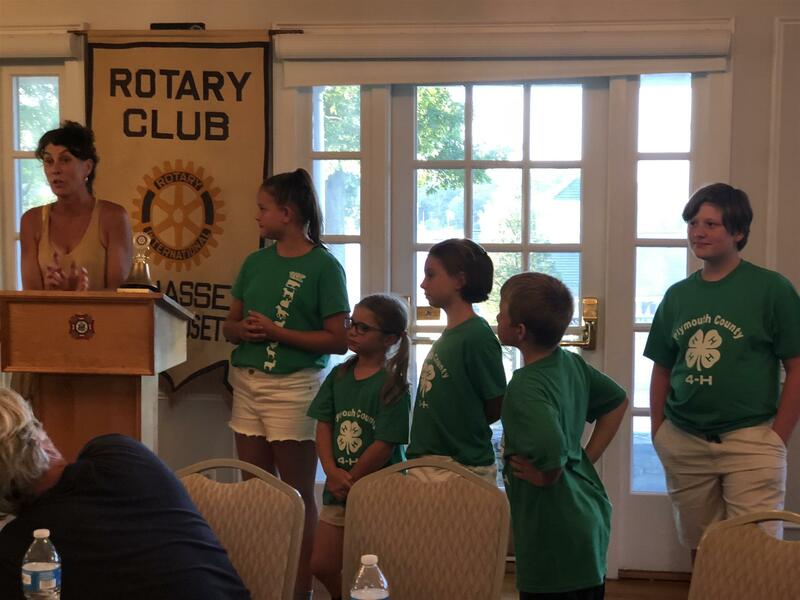 Additionally the Cohasset Club donates $100/member to the Rotary Foundation which supports and fund grants worldwide to support disease prevention, literacy, clean water, education as well as maternal and child health. 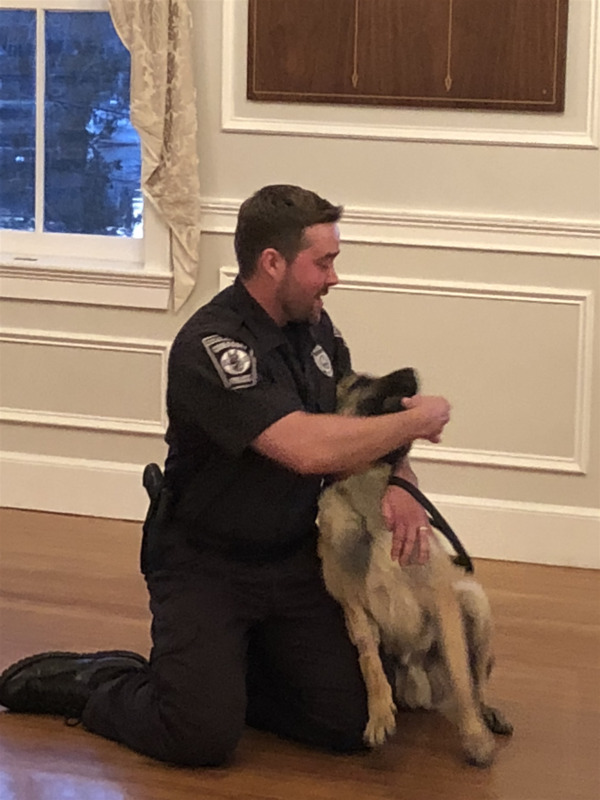 Our guest on Monday was a familiar face at Cohasset Schools. 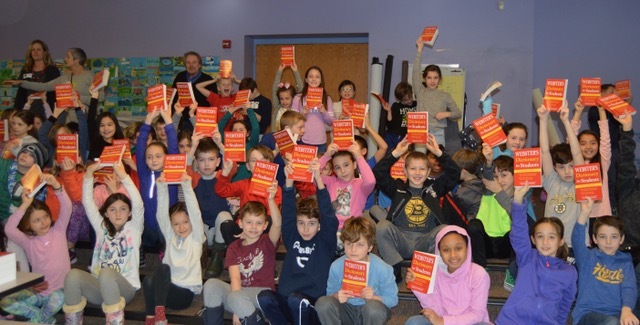 Aleisa Gittens-Carle, METCO Coordinator for the Cohasset Public Schools cane to speak about the student program with students from Boston becoming a part of the Cohasset School District. 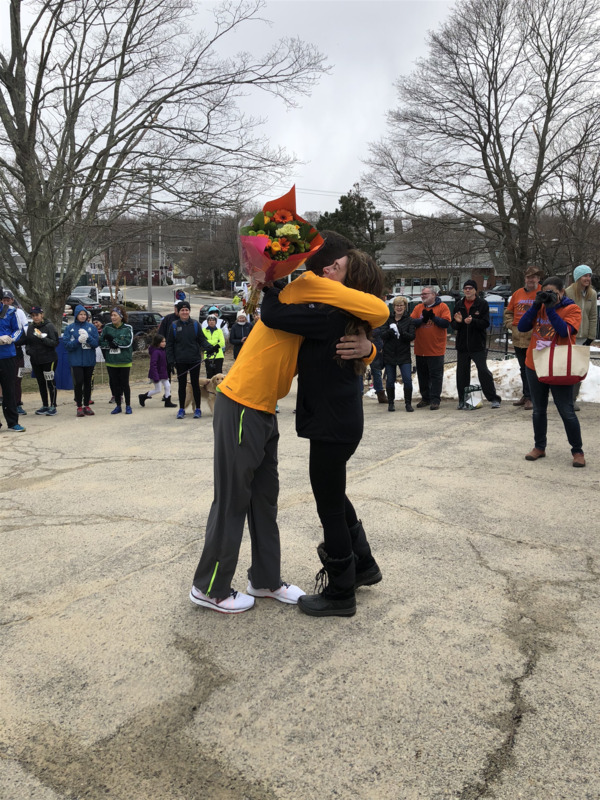 Ms. Gittens-Charle graduated as a METCO student from Scituate High School. Went on to Tufts U, then Simmons for an MSW and Master's of Education. She is also a pastor and holds a certificate as a principal for a middle-high school. 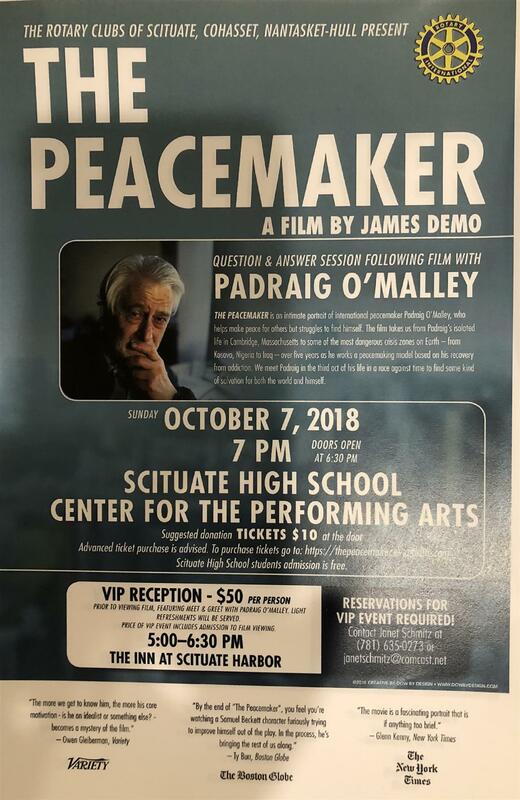 Professor Padraig O’Malley, U Mass Boston is a renown international peacemaker who will be screening his lastest film Peacemaker showing his work and holding a question and answer after the film at the Scituate High School Oct. 7, 7PM. (See poster below.) 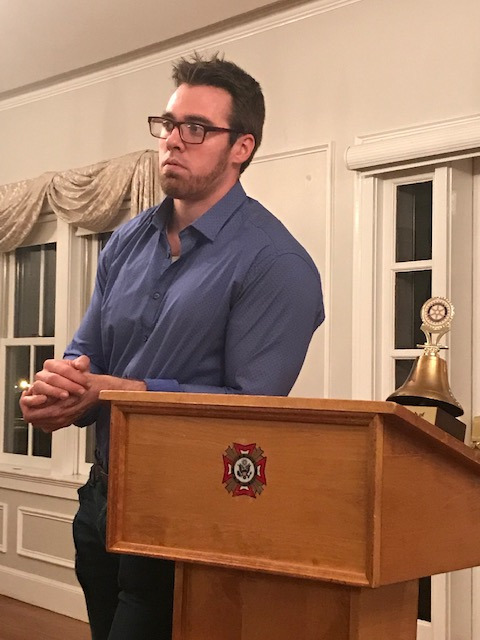 Padraig was instrumental in ending the Irish Protestant/Catholic battles, and continues in Kosovo, Nigeria and Iraq… all based on his personal recovery from addiction model. This is a film of addiction, recovery and creating something larger than you can ever imagine in the process, for students and adults. 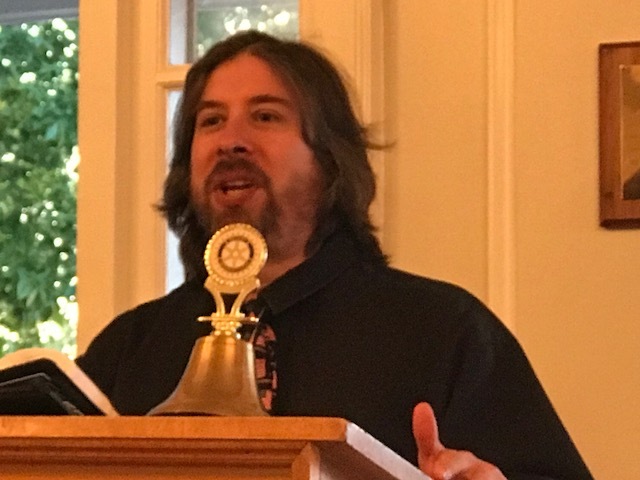 Welcome John McCarthy to Rotary! 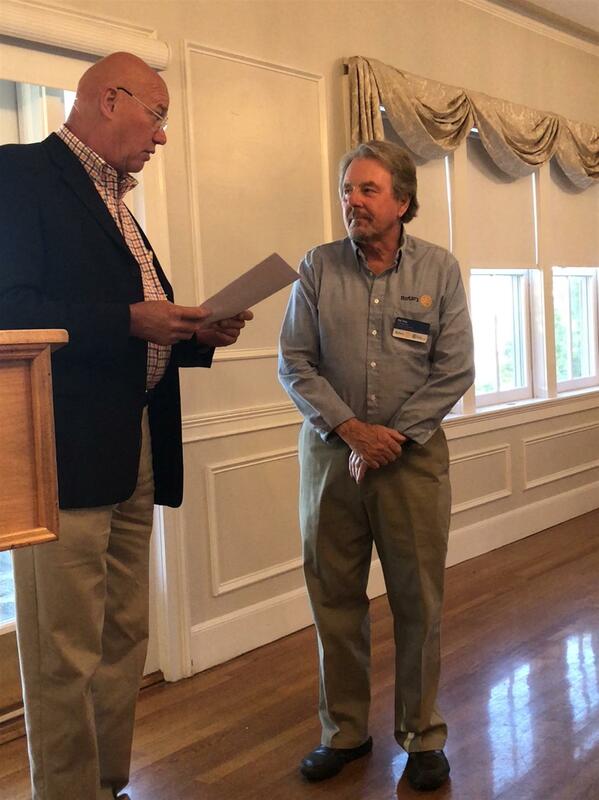 Our newest member of the Cohasset Rotary Club is Dr. John McCathy a chiropractor in Cohasset. 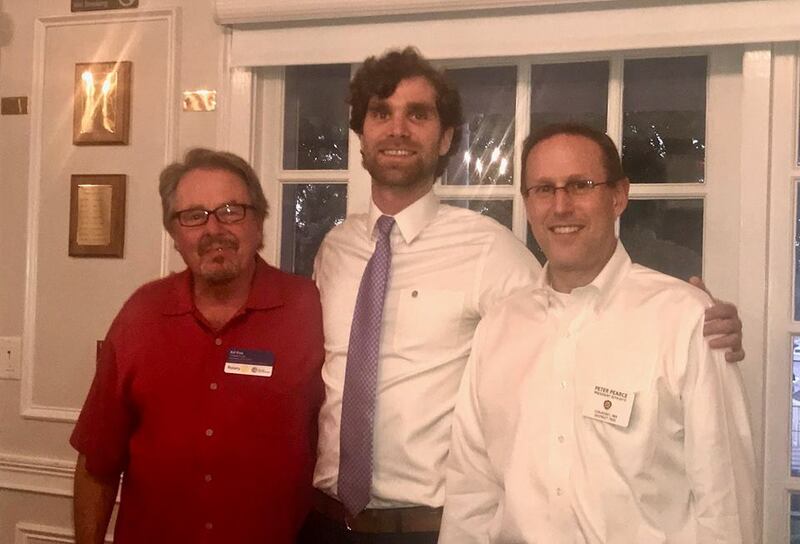 Pictured is President Ed Fox and Sponsor Peter Pearce with Dr. John McCarthy. 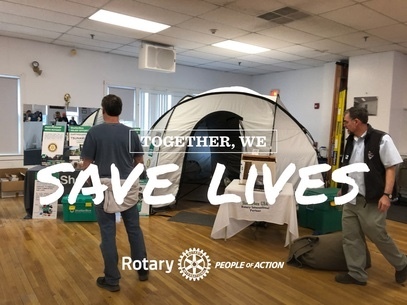 Every year the presiding District Governor (DG) visits every one of the 72 clubs in the district each year. 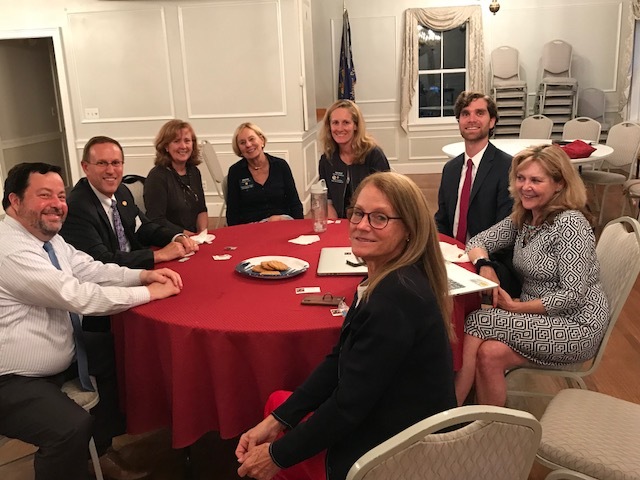 Our District covers the South Shore, Cape and Islands and Rhode Island, and our DG is Bill Tenant from the Braintree Club. 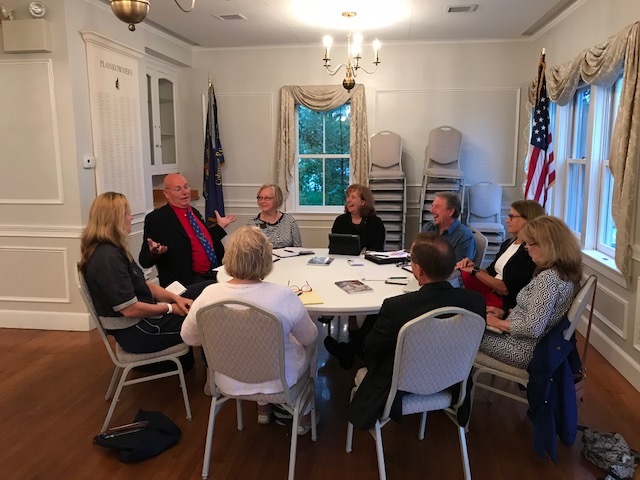 Tonight was our visit from the DG where our President Ed Fox present his club's plan to the Governor and the Cohasset Club hear from the Governor where Rotary would like us to focus, and be the inspiration in 2018-19. 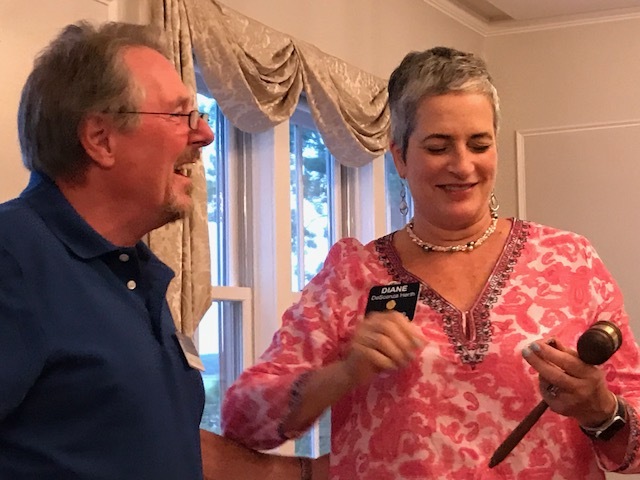 President Ed Fox presents Diane Herth her personal gavel and Past President pin with a diamond in appreciation for her two years as President. 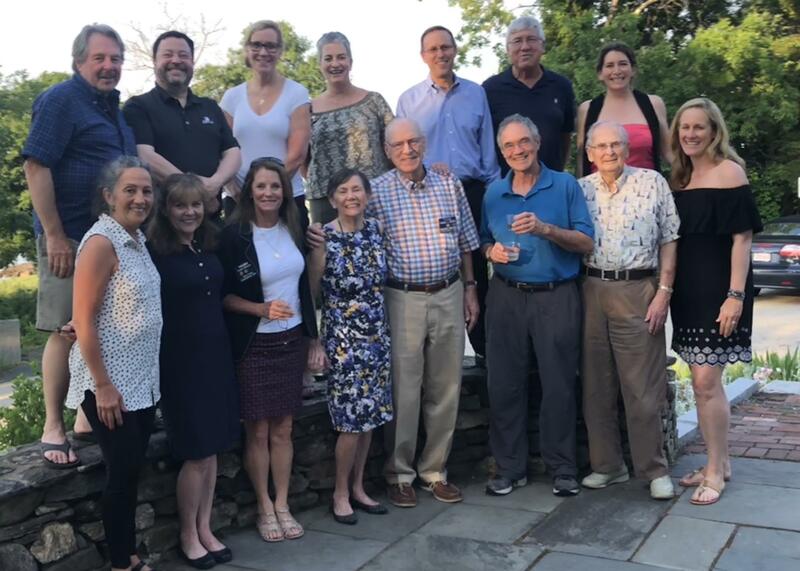 The Cohasset Rotary Club bid farewell to Rotarian Tom and wife Kathie Gruber this evening, as they move to Georgia this week. 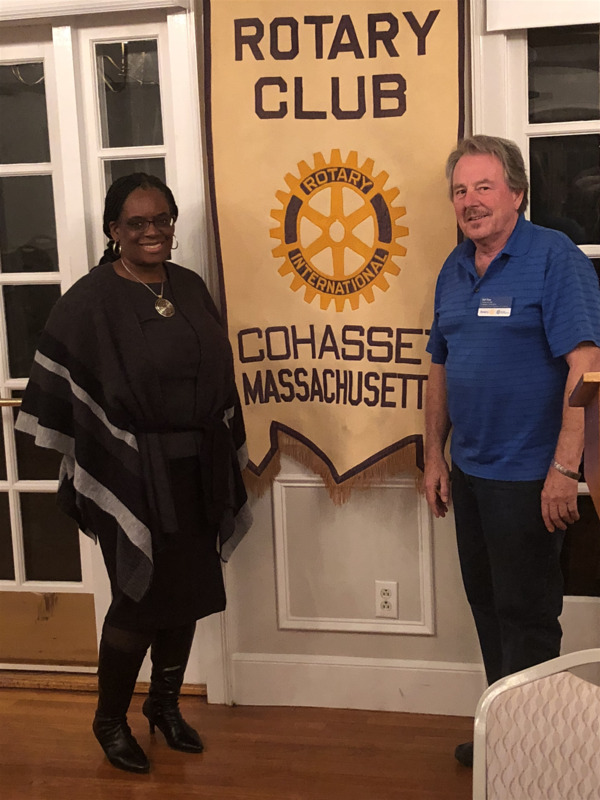 Tom has been a devoted Rotarian since June 21, 1982, who when not in Cohasset attends a Florida club for near perfect attendance year after year. 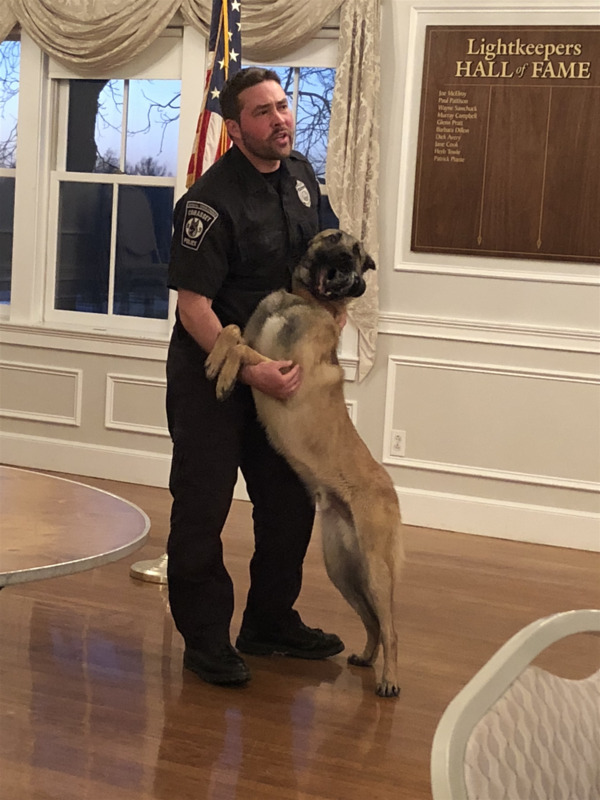 Officer Reardon and new canine partner Einstein visited the Cohasset Rotary Club on Monday to introduce Cohasset’s newest working police dog, an eleven month old Belgian Malinois who trains daily with Officer Pat Reardon. 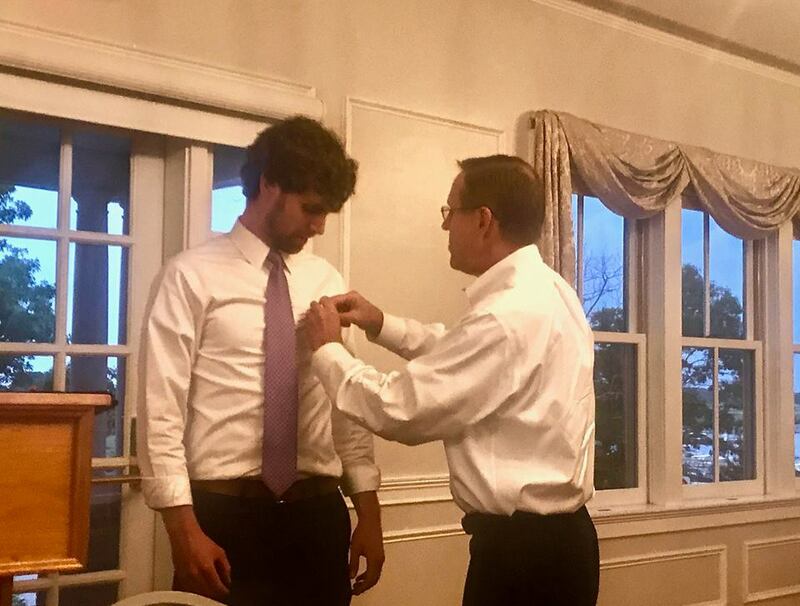 The new officers were installed tonight by Past-President Peter Pearce. 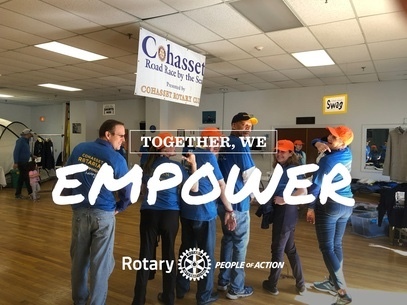 Diane Herth resumed as president from two years ago, Ed Fox is President Elect, Lisa Hewitt is treasurer for a third year, and Mal McCunney our newest Rotarian stepped up as Secretary. 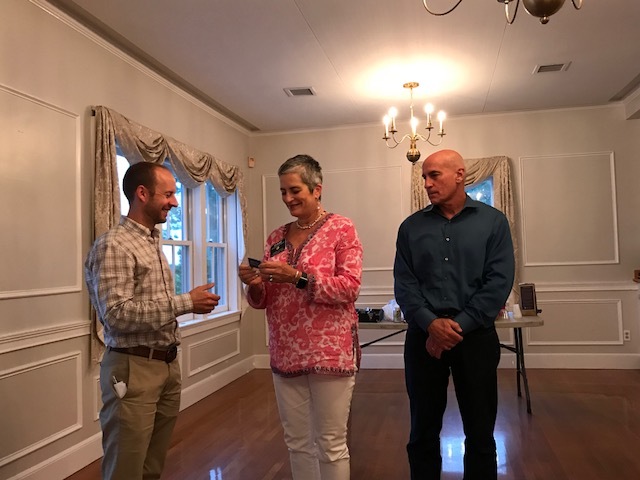 Thank you Mark Petrie for your service this past year (7/2016-6/2017) as president. 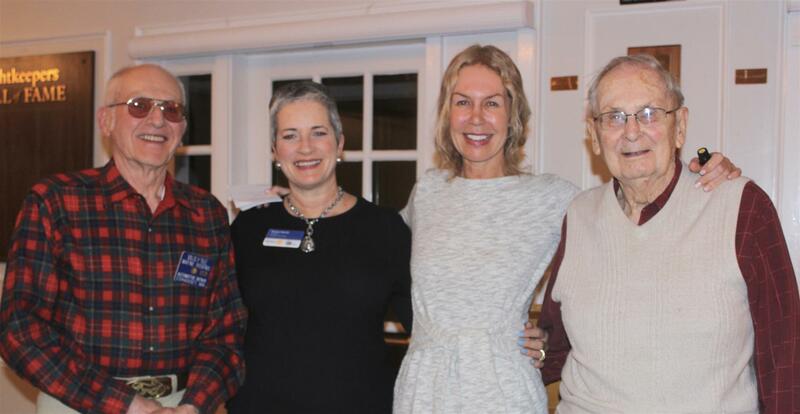 Hopefully as Past-President you can get in a little more tennis! 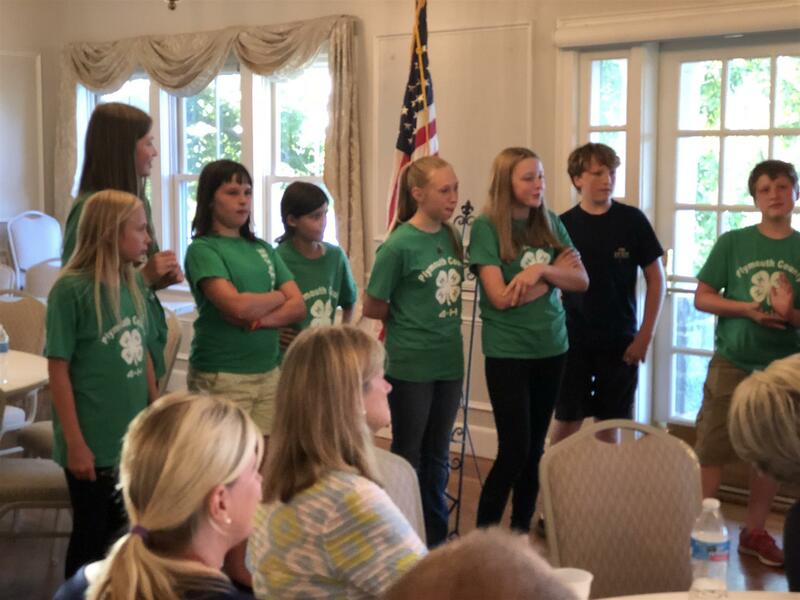 We are excited to meet tonight to discuss with Helen Blowers of Weymouth Rotary, Principal Carolyn Connolly, staff and students to create an Interact Club for the Middle-High School students where they will learn to fund and hold service project, expand their networks, foster international understanding, and deepen relationships with other Interactors whilel they all grow as leaders! 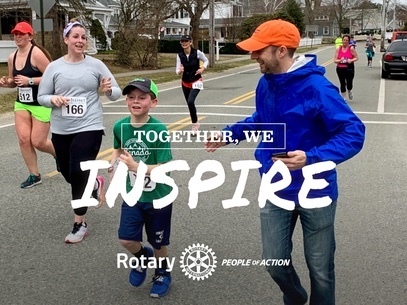 Rotary Club of Cohasset Facebook page - LIKE US!